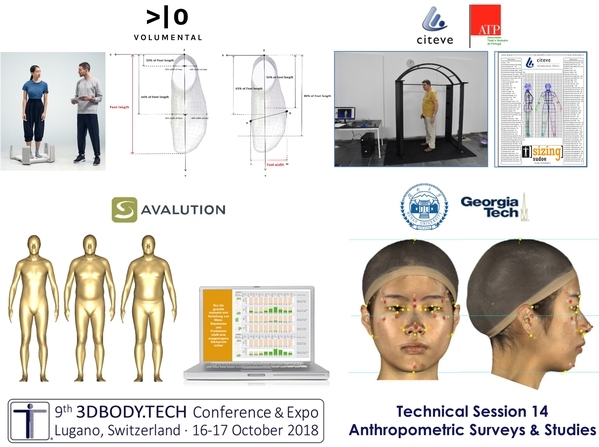 3DBODY.TECH 2018 - The 9th International Conference and Exhibition on 3D Body Scanning and Processing Technologies was successfully closed in Lugano on the evening of 17th October 2018. About 230 participants from 35 different countries attended/visited the two days conference and exhibition in Lugano, Switzerland. The conference started with an opening session with the presentations and announcements of world and international premieres from manufacturers or 3D body scanning solutions. full body scanning and ML/AI. The conference was accompanied by an exhibition where 22 manufactures and solution providers were presenting and demonstrating their face, body & foot scanning systems and/or software solutions. The major technologies were represented: white-light scanning, laser scanning, active photogrammetry, passive photogrammetry, RGB-D sensing, application software, 3D printing solutions. The application sectors were also various: apparel, medicine, health, anthropometry, 3D printing, AR/VR and others. The conference confirmed also this year to be the most important international event focused on 3D body scanning & processing technologies. An edited verion of the joined opening and closing presentations of the conference director Dr. Nicola D'Apuzzo are available to download as a single file at the following link: PDF file. 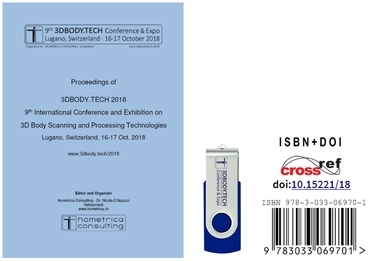 The proceedings of the conference (ISBN 978-3-033-06970-1, doi:10.15221/18) are available in digital form (html structure and PDF files) on USB-flash drive or FTP download. The cost of the proceedings is 50CHF. For orders, please contact the conference office. The contents of the proceedings is available as PDF file. 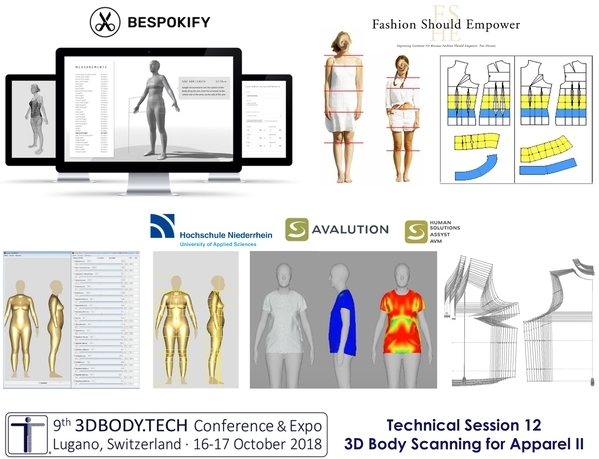 All the submitted abstracts and papers are available at the website www.3dbody.tech/cap, which is dedicated to the proceedings of the serie of conferences and workshops on 3D Body Scanning & Processing Technologies. Note: many of the presentations featured in the program of the conference do not have abstracts and/or papers. 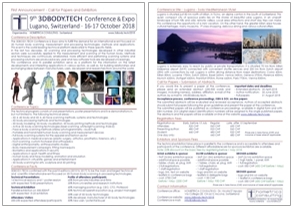 3DBODY.TECH 2019 - The 10th International Conference and Exhibition on 3D Body Scanning and Processing Technologies will take place on 22-23 October 2019, in Lugano, Switzerland. 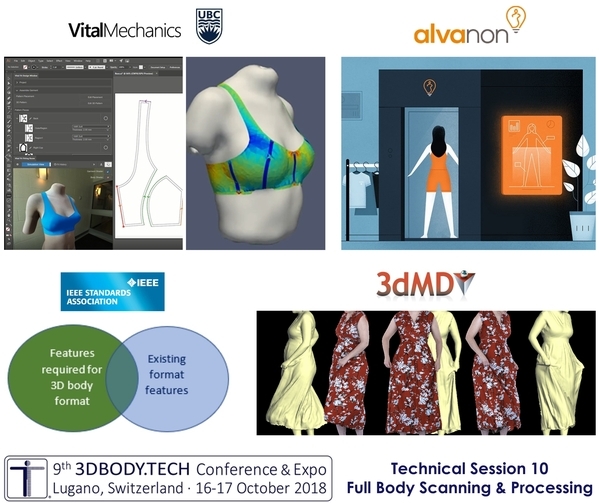 The 9th 3DBODY.TECH Conference & Expo will take place next week on Tuesday 16 and Wednesday 17 October, in Lugano, Switzerland. Please join the over 230 already registered attendees in order to listen over 70 presentations in 14 technical sessions and see over 20 face, body and foot scanning solutions and various application software from 22 exhibitors at the technical exhibition. Check at this link the techinical program: program. Check at this link the list of exhibitors: exhibition. Check at this link the already registered attendees: participants. If you wish to attend the conference and visit the exhibition, please do not forget to pre-register by sending us the filled registration form available at the following link: registration. Note: registration on-site is also possible by payment in cash or credit-card. 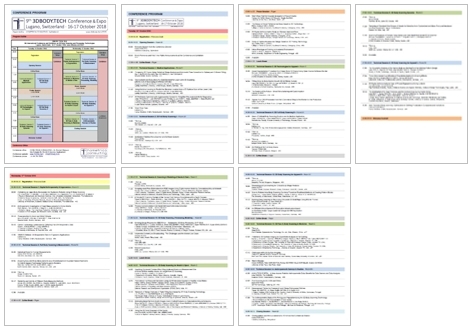 Outline of the conference program (click to enlarge). 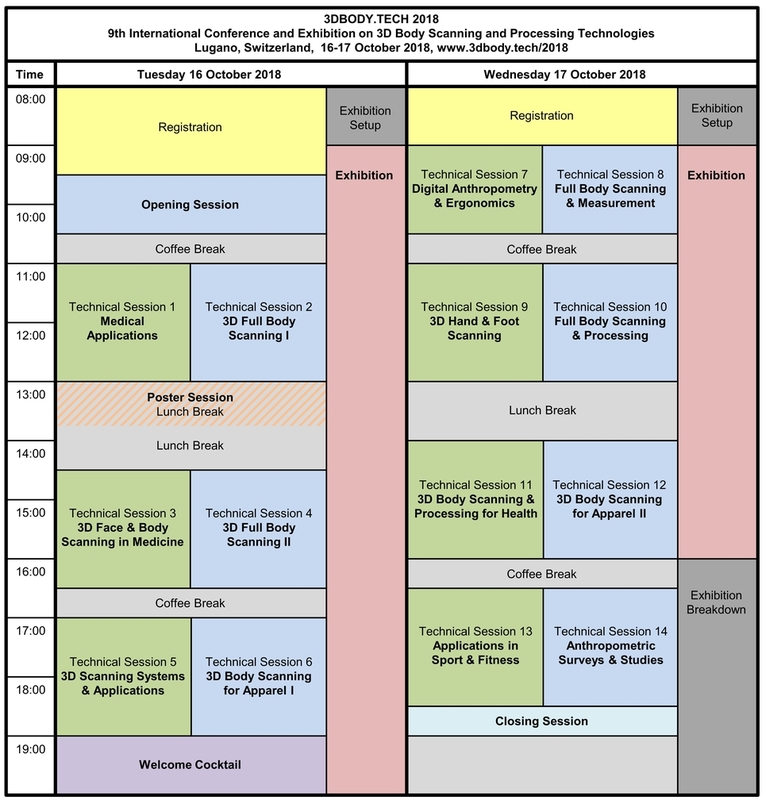 The program of the conference is structured, during two full days, in an opening session and 14 technical sessions in dual track, accommodating in total over 70 scientific and technical presentations, grouped according to various topics and application areas. 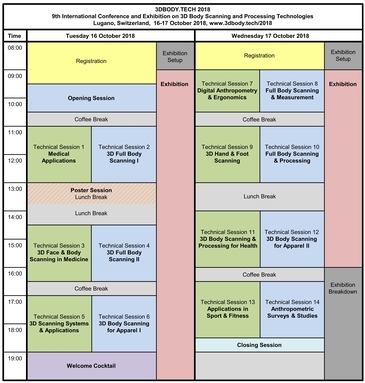 The program of the conference is available as PDF file: 3dbody2018_program.pdf. 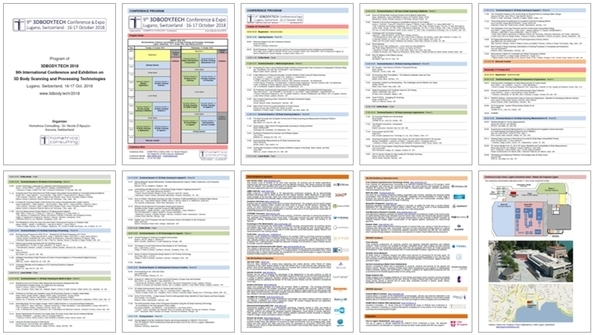 Program of the conference (click to download). If you wish to attend the conference and visit the exhibition, please do not forget to register by sending us the filled registration form available at the following link: registration. We are pleased to announce that we have already 200 registered attendees/participants. 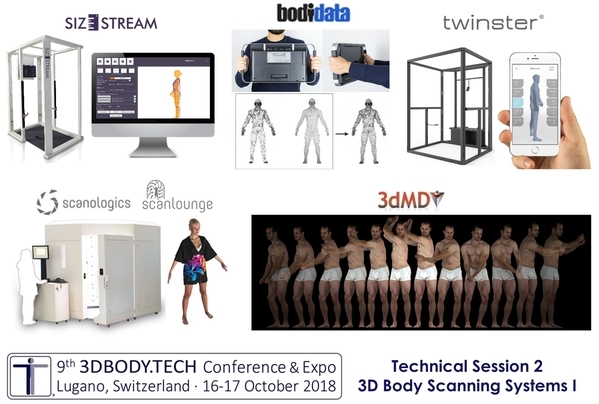 3DBODY.TECH 2018 - The 9th International Conference and Exhibition on 3D Body Scanning and Processing Technologies will take place in two weeks on 16-17 October 2018, in Lugano, Switzerland. 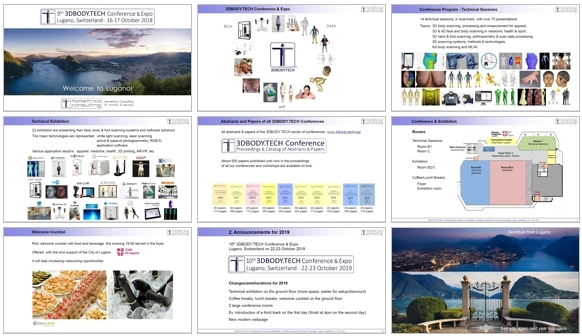 The following images show previews of some of the contents of the conference & expo. Please note that pre-registration is required for all attendees and participants of the conference and exhibition. Information about registration and fees: registration. Vital Mechanics Research Inc. / University of British Columbia (Canada) will participate at the conference's exhibition. 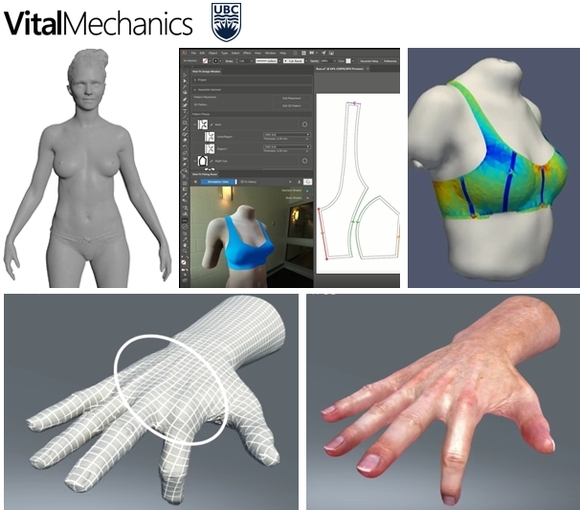 Vital Mechanics Research (Canada) develops the world's most advanced computational models of the human body. Its patent-pending technology simulates how the human body moves and interacts with physical objects, leveraging two decades of research in soft tissue biomechanics at the University of British Columbia. Its software solutions enable digital transformation of the apparel pipeline, particularly for close-to-body garments. 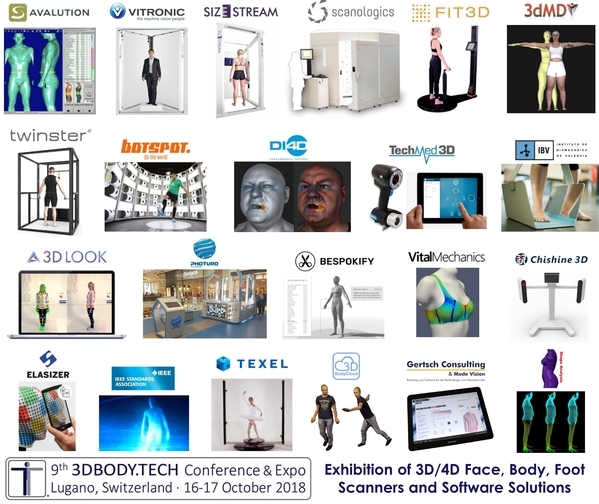 The City of Lugano is supporting the 3DBODY.TECH Conference & Expo. 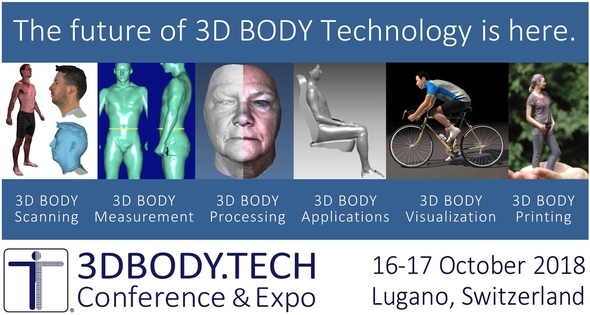 The city of Lugano is officially supporting the 3DBODY.TECH Conference & Expo. The welcome cocktail offered to all attendees on Tuesday evening has been made possible with the city's support. Shape Analysis (UK) will participate at the conference's exhibition. Shape Analysis was formed in 2002 by two research scientists. The company is capitalising on their 50+ years experience of research in clothing and textiles for the Ministry of Defence. Shape Analysis is the European distributor for Size Stream and Space Vision scanners. They are also the worldwide exclusive distributors for CAESAR survey data. Shape Analysis has extensive experience in the development and use of 3D capture systems. Their services have been used for the sational sizing survey SizeUK, ShapeGB and many other companies involved in the fashion industry, health, fitness, sportswear and medical applications. Note: many presentations featured in the program of the conference do not have abstracts and/or papers. Fit3D Inc. (USA) will participate at the conference's exhibition. 600,000+ scans collected from patented scanners in 45 countries. Fit3D is a 3D body scanning & analytics company that supports fitness & wellness institutions around the world. Fit3D is growing at an astounding rate, collecting another scan every single minute. 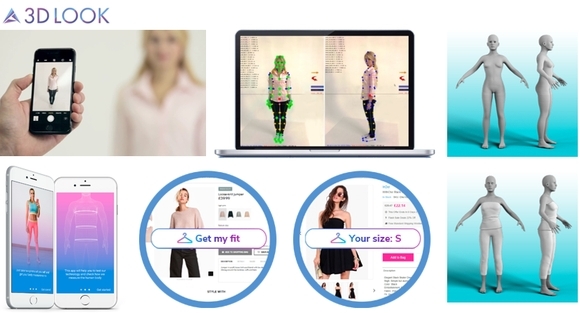 Fit3D recently launched the platform "BodyBlock AI" that is helping Tier 1 clothing brands change their approach to design & eCommerce in order to reduce returns & increase customer satisfaction. Dimensional Imaging Ltd. (UK) will participate at the conference's exhibition. Dimensional Imaging (DI4D) is a world-leading technology company formed in 2003 and based in Glasgow, Scotland and Los Angeles, California. 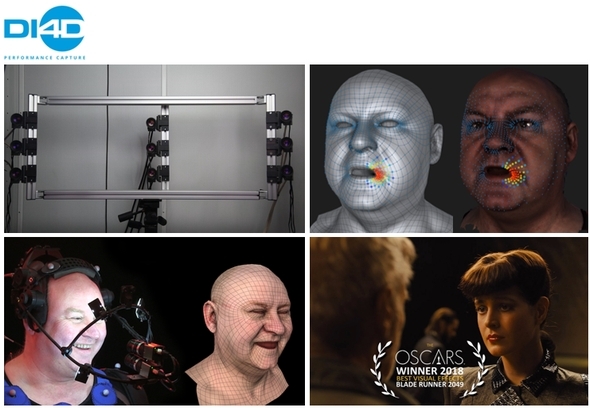 DI4D provides 3D and 4D facial performance capture services, systems and software for advanced research applications, visual effects in movies, television, video games and virtual reality (VR). DI4D's leading research customers include University of Glasgow, Imperial College London and Dallas Children’s Hospital. We are pleased to announce that we have already more than 150 registered attendees. botspot GmbH (Germany) will participate at the conference's exhibition. Since 2013 botspot develops and builds 3D scanners "Made in Germany". The scanning technology utilizes photogrammetry that enables contactless, rapid and completely safe scanning without any laser. Objects of every size and every shape are scanned in just 0,01 seconds, the digital 3D replica appears as ultra precise data with highly colorfast texturing. In the special botspot R&D department, are realized individual complete scanning solutions within every scope of application. Avalution GmbH (Germany) will participate at the conference's exhibition. 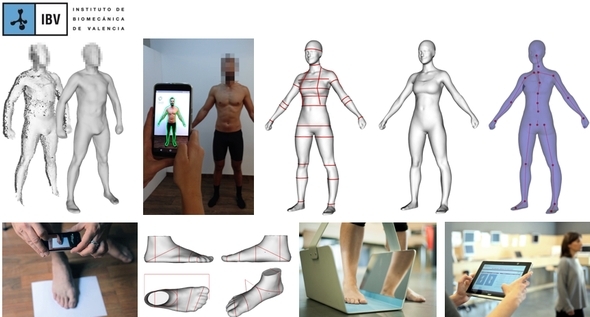 The new founded Avalution GmbH, a subsidiary of the Human Solutions Group, took over the Human Solutions Group's body scanning, serial measurements and sizing & fitting divisions on August 2018. Avalution puts the human being at the heart of product development, supporting companies with the optimal orientation of their products on their target groups. We are pleased to announce that we have already more than 100 registered attendees. 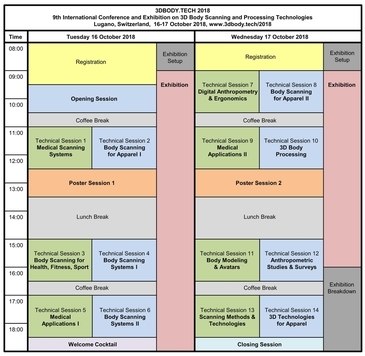 The preliminary program of the conference is available as PDF file: preliminary program. 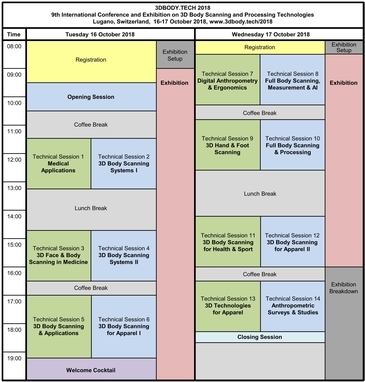 The program of the conference will be structured, during two full days, in an opening session, 14 technical sessions in dual track and 1 poster session, accommodating in total over 70 scientific and technical presentations, grouped according to various topics and application areas. 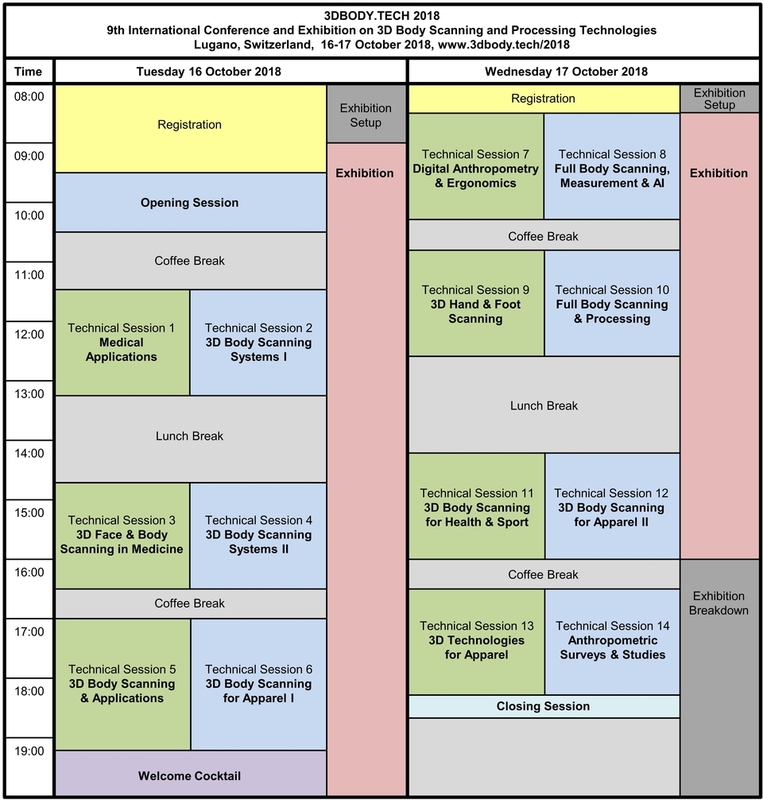 Preliminary outline of the conference program (click to enlarge). Coffee breaks will take place in the morning and afternoon, lunch boxes will be distributed to all attendees during lunch breaks and a welcome drink will be offered after the last session of the first day of the conference. Please note that registration is required for all attendees and participants of the conference and exhibition (call for registrations: PDF file). Information about registration and fees is available here. 3D Body Cloud (Belgium) will participate at the conference's exhibition. 3D Body Cloud is a software company that offers cloud services for processing 3D full body scans. 3D Body Cloud's API supports back offices by offering automated processing pipelines to turn raw 3D scans into producible and/or publishable results, such as 3D printed figurines, 2.5D products, rigged models and animation videos. Photuro 3D Ltd. (Israel) will participate at the conference's exhibition. Photuro 3D Ltd. is set to make state-of-the-art 3D imaging technologies easily available for the masses. Its business model brings high-definition 3D scanners to retail environments, such as shopping malls, trade-shows and other events and offers post-scan online 3D experience to consumers. PHOTURO Booth enables to scan visitors in three-dimensions and to have within a few minutes their quality virtual image or a printed model at an affordable price. The call for registrations of the conference is available as PDF file: call for registrations. Please note that registration is required for all attendees and participants of the conference and exhibition. Information about registration and fees is available here. Gertsch Consulting & Mode Vision (Switzerland) will participate at the conference's exhibition. Gertsch Consulting & Mode Vision is specialized on products, solutions and services for the apparel and fashion industry. 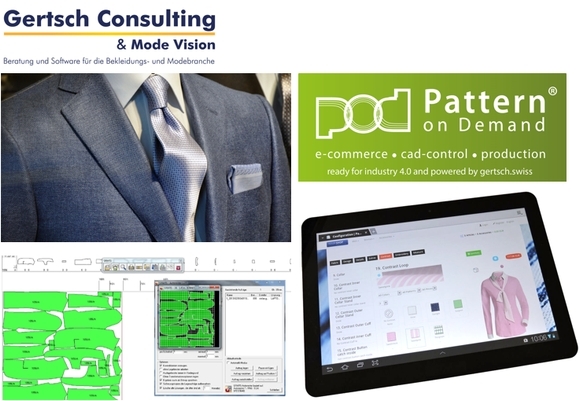 Gertsch Consulting & Mode Vision offers manufacturers and suppliers of individualized made-to-measure clothing, the "pod-Pattern on Demand", a platform for digitizing the processing from the e-commerce to the finished layplan/marker for the cutting room. Submission of abstracts is now closed and the preliminary conference program is being prepared. The number of abstracts received is within our expectations. The conference promises therefore to be a successful event with a full program of 14 technical sessions with over 60 presentations covering relevant sectors of 3D body scanning and 3D body processing, as face and body scanning for medicine, body scanning for fashion and apparel, digital anthropometry and ergonomics, body size measurement campaigns, body scanning for health and sport, body modeling and avatars, virtual draping and virtual try on, scanning with depth cameras and low cost sensors, scanning methods and technologies. 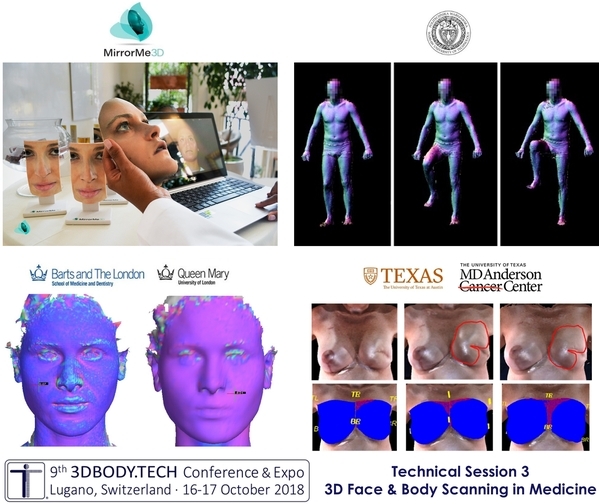 Note: for any questions about late abstract/paper submission, please send an email to the conference office info@3dbody.tech. Please note that registration is required for all attendees and participants of the conference. Information about registration and fees is available here. twinster (Austria) will participate at the conference's exhibition. twinster has the goal of bringing the advantages of the digitalization to the end customer as well as companies. It's focus lies on holistic and innovative solutions in the area around 3D body measurements in a variety of different segments. 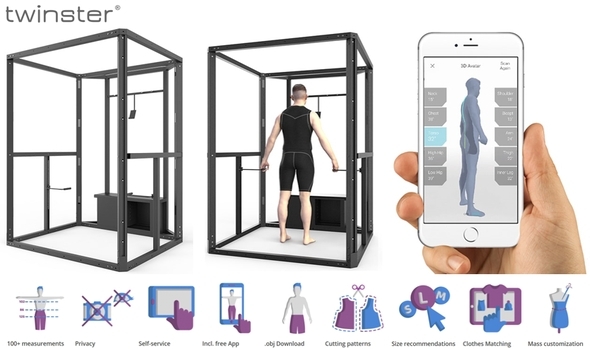 twinster's solution allows the automatic body measurements in 3D in complete privacy by operating the twinster 3D full body scanner directly over the customer's smartphone via an App. The Second Announcement - Call for Papers and Exhibitors is available: 2ndcall (PDF). Authors wishing to present their works at the conference are invited to submit their extended abstract(s) to the conference office. Extended abstract should consists of 250-500 words and images. Due to multiple requests from prospective authors, the deadline for abstract submission has been extended until 31 May 2018. More details are available at the authors' page: authors. GOLD exhibitor & sponsor, SILVER exhibitor & sponsor, BRONZE exhibitor, BRONZE sponsor. More details are available at the exhibition page: exhibition. - 200-300 expected international attendees at the conference and exhibition. 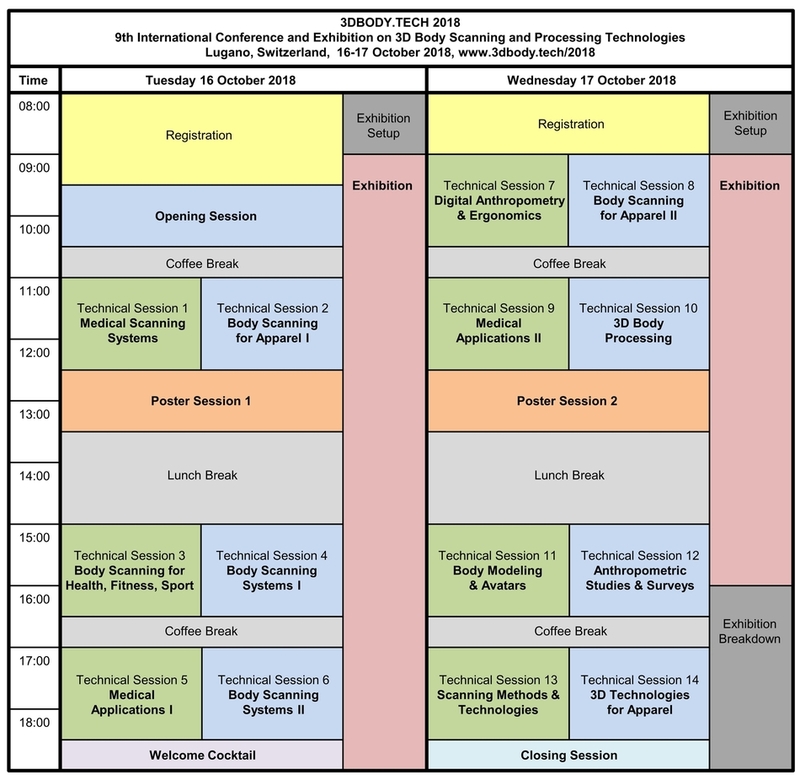 Human Solutions GmbH (Germany) will participate at the conference's exhibition. 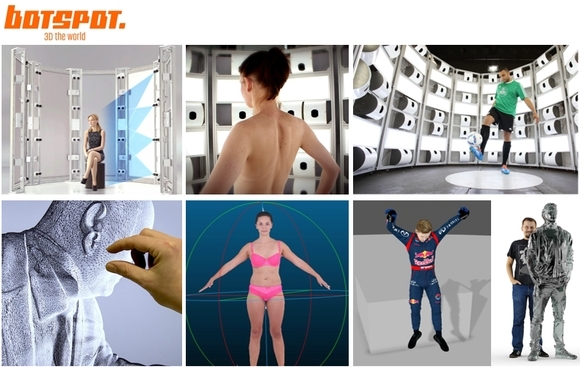 Human Solutions is a world market leader for body scanning and ergonomics simulation. Systems from Human Solutions are used by more than 300 companies worldwide. 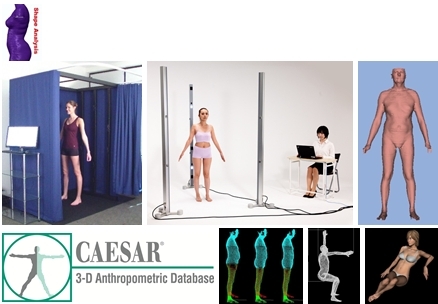 3D body scanning by Human Solutions offers highly accurate method of measurement and allows the integration of size & fit data into various processes at the same time. VITRONIC Dr.-Ing. Stein Bildverarbeitungssysteme GmbH (Germany) will participate at the conference's exhibition. With 20 years of experience in the field of body scanning, VITRONIC (Germany) is among the pioneers of fast, automatic 3D measuring of the human body. VITUS body scanners are used around the world for customized clothing, standardization, ergonomics, orthopedics, sports medicine, and printing of 3D figurines. Instituto de Biomecànica de Valencia IBV (Spain) will participate at the conference's exhibition. 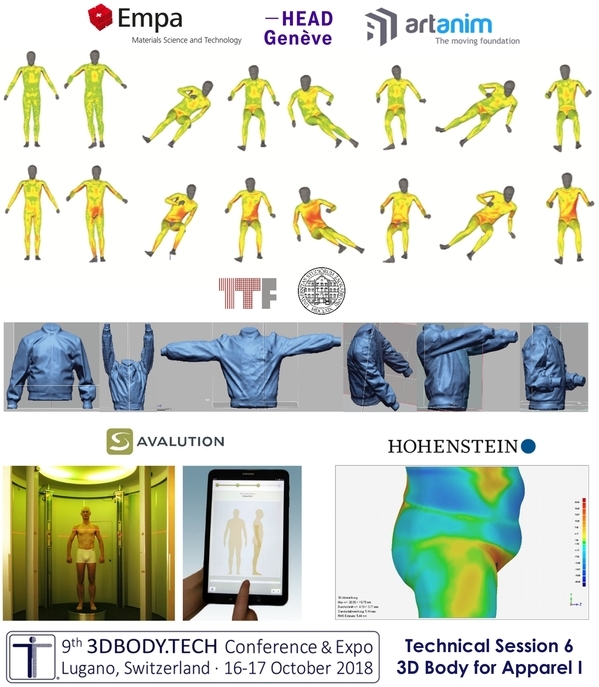 The Institute of Biomechanics IBV offers novel 3D data treatment tools (accurate and automated creation of avatars from 3D raw scans, 2D pictures or 1D measurements; 3D databases harmonisation tools, virtual measuring tape or shape analysis tools) and smartphone 3D scanning technologies to support innovative business models based on user anthropometry. Texel Inc. (Russia) will participate at the conference's exhibition. Texel (Russia) produces professional 3D scanning systems and develops dedicated algorithms and software solutions. Texel's scanners are available at strongly competitive prices compared to similar solutions on the market; they produce accurate scanning results and have an outstanding price/quality ratio; they are equipped with hi-tech 3D model processing cloud platform. These results are achieved with in-house developed hardware, algorithms and software. Scanologics BV (Netherlands) will participate at the conference's exhibition. 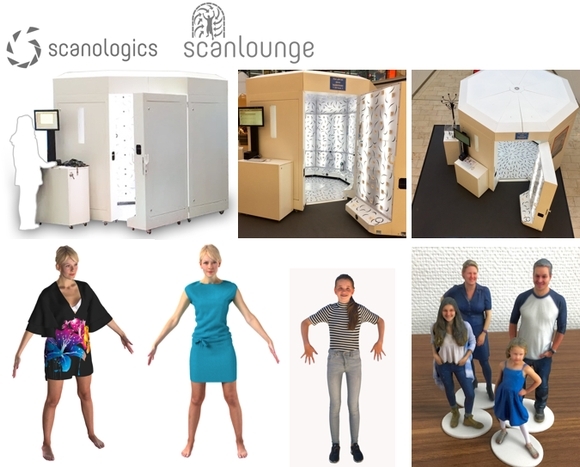 Scanologics had developed the ScanLounge, a portable, full body, photogrammetry 3D scanning solution and delivers high quality results. Currently scanning over 150.000 people per year. Scanologics offers a full service solution. The scans can be used to create figurines, personalise games, rigging, research and measurements for the clothing industry. Xi'an Chishine Optoelectronics Technology Co. Ltd. (China) will participate at the conference's exhibition. Xi'an Chishine Optoelectronics Technology is an high-tech company originated in Xi'an and backed by Xi'an Jiaotong University and Xi'an Institute of Optics and Precision Mechanics. Chishine focuses on 3D digitization systems and artificial intellingence solutions, holding the notion of "accurate and easy scan". 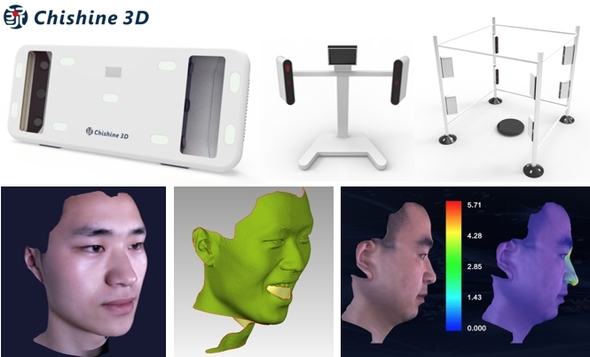 Chishine ultra-fast portable 3D face scanners are used in the fields of medical plastic surgery, ortodondics, cosmetics, biometry and others. The IEEE Standards Association (USA) will participate at the conference's exhibition. The IEEE Standards Association Industry Connections program brings together focused interest groups to address standards related considerations in emerging technology areas. 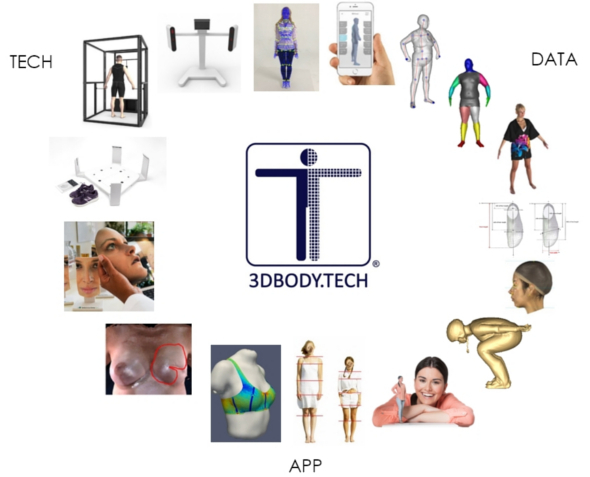 The Industry Connections 3D Body Processing group brings together an ecosystem of players to co-develop an assessment of standards needs and to propose new standard(s) around enabling 3D body processing which includes the capture, processing, storage, sharing and (augmented) representation for "Of-the-body" and "On-the-body" technologies. This exploration includes identification and classification of types and uses cases for 3D body processing; identification of gaps in existing nascent standards and recommended practices as 3D body processing spreads beyond first adopters; identifying needs and develop proposals for new standards and best practices for 3D body processing and adjacent technologies (like 2D augmented reality). Bespokify (Singapore) will participate at the conference's exhibition. Bespokify offers automatic solutions for custom designed and fitted patterns for pattern retailers, tailors and dressmaker, apparel brands, uniform manufacturers. 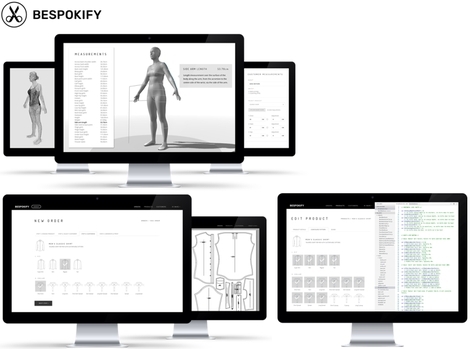 Bespokify's API creates bespoke apparel patterns instantly and automatically, directly from 3D body scans, manual measurements and order details from websites. Elasizer Srl (Italy) will participate at the conference's exhibition. 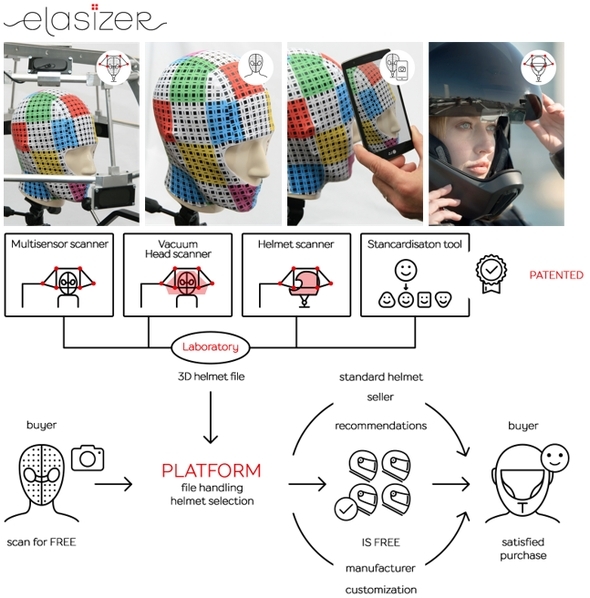 Elasizer offers unique ground-breaking solution for human body scan, aiming to make the process of individual wear fitting fast, easy, and precise. 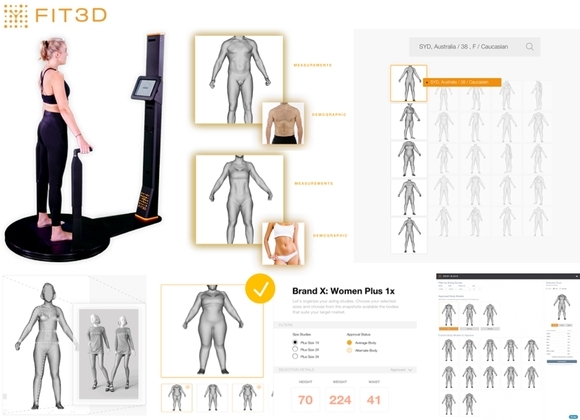 The easy 3D body scanning technology based on a special elastic measuring garment is a compromise between expensive measuring rigs and low cost methods. Elasizer narrows the gap between manufacturer and customer in modern mass market and line production while at the same time paving the way to mass customization. 3dMD Ltd. (UK/USA) will participate at the conference's exhibition. 3dMD, a proven leader in 3D high-precision anatomical scanning, will be demonstrating workflow efficiencies with its latest temporal-3D (4D) capture systems. 3dMD sequences of high-quality motion images of the full body, head, foot, and/or hand help promote and advance the creation of new wearable technologies that precisely adapt to a person's shape and enhance performance. 3DLOOK (USA) will participate at the conference's exhibition. 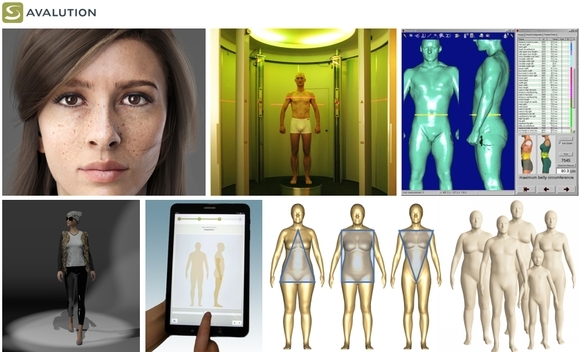 3DLOOK offers solutions for instant body measuring from mobile devices. SAIA Perfect Fit allows customers of any online apparel retailer to find their perfect size in a few seconds after uploading only 2 photos. SAIA 3D is an API that can generate 3D body models of a customer with 2 photos for subsequent use for virtual try-on, pre-production and fit stages of manufacturing. The deadline for abstract submission is 30 April 2018. TechMed 3D Inc. (Canada) will participate at the conference's exhibition. TechMed 3D is specialized in body measurement technologies and digital imaging solutions adapted to the orthotics, prosthetics and custom equipment market. 3D surface imaging devices and application software will be demonstrated at the exhibition. 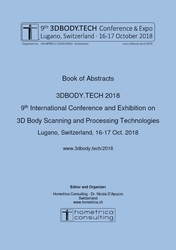 Registration is now available for 3DBODY.TECH 2018 - 9th International Conference and Exhibition on 3D Body Scanning and Processing Technologies, 16-17 Oct. 2018, Lugano, Switzerland. Registration is required for all attendees and participants of the conference and exhibition. Information about registration fees and the registration form are available here. The First Call for Papers and Exhibitors is available: 1stcall (PDF file). Authors wishing to present their works at the conference are invited to submit their extended abstract before 30 April 2018. For sponsors and exhibitors we offer four different packages: GOLD exhibitor and sponsor, SILVER exhibitor and sponsor, BRONZE exhibitor, BRONZE sponsor. Important note: 20% discount is offered on the basic fees by registering before 1 May 2018. Anatomi Metrix Inc. (Canada) will participate at the conference's exhibition. Anatomi Metrix Inc. is focused on the development of technologies, devices and protocols dedicated to the anatomical measurements and evaluation of conditions of the human hand. Manu3, a device developed by Anatomi Metrix, is a touch-less portable desktop optical laboratory instrument to measure the anatomical dimensions of the hand and fingers in terms of lengths and circumferences. Size Stream (USA) will participate at the conference's exhibition. 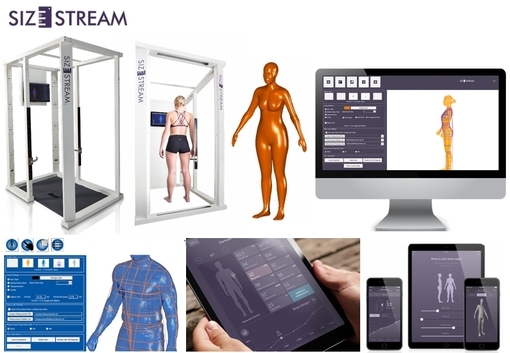 Size Stream is focused on 3D color body scanning, 4D scanning and all related applications requiring high performance, high automation and cost effective solutions. Size Stream products are widely used for research, size prediction and custom fit specification of clothing, body measurement for health and fitness applications and color 3D printing applications. For sponsors and exhibitors we offer four different levels: GOLD exhibitor and sponsor (ideal for large OEMs exhibiting 3D full body scanning equipment), SILVER exhibitor and sponsor (ideal for OEMs exhibiting desktop 3D body scanning equipment or for providers of solutions and systems), BRONZE exhibitor (ideal for small firms demonstrating solutions or portable 3D body scanning equipment during the breaks), BRONZE sponsor (ideal for OEMs or solution providers not able to participate at the exhibition). 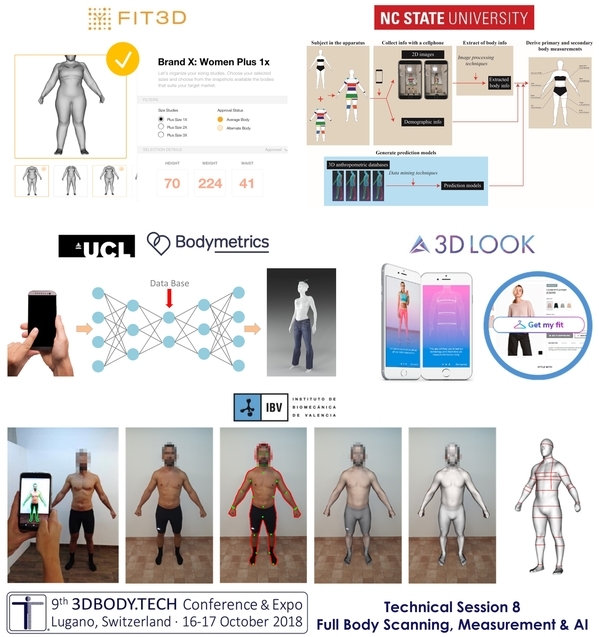 The website of 3DBODY.TECH 2018 - The 9th International Conference and Exhibition on 3D Body Scanning and Processing Technologies 2018 is online: www.3dbody.tech/2018. 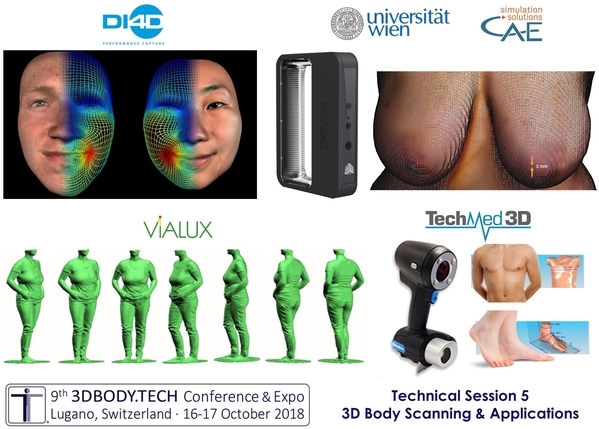 Download the flyer of 3DBODY.TECH 2018: PDF file. 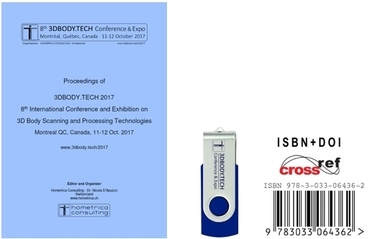 3DBODY.TECH 2017 - The 8th International Conference and Exhibition on 3D Body Scanning and Processing Technologies was successfully closed in Montreal on the evening of 12th October 2017. About 180-190 participants from 31 different countries attended/visited the two days conference and exhibition in Montreal QC, Canada. The very dense program included 14 technical sessions, 1 poster and live demonstration session, with over 70 technical and scientific presentations. The topics discussed regarded: medical scanning systems & medical applications, body scanning for apparel, anthropometric studies & surveys, digital anthropometry & ergonomics, body scanning methods & technologies, body modeling & processing, and others. The conference was accompanied by an exhibition where manufactures were presenting and demonstrating their body scanning systems and/or software solutions. The major technologies were represented: white-light scanning, laser scanning, active photogrammetry, passive photogrammetry, RGB-D sensing, application software, 3D printing solutions. The application sectors were also various: apparel, medicine, health, anthropometry, 3D printing and others. An edited verion of the joined opening and closing presentations of the conference director Dr. Nicola D'Apuzzo are available to download as a single file at the following link: PDF file (15MB). The proceedings of the conference (ISBN 978-3-033-06436-2, doi:10.15221/17) are available in digital form (html structure and PDF files) on USB-flash drive or FTP download. 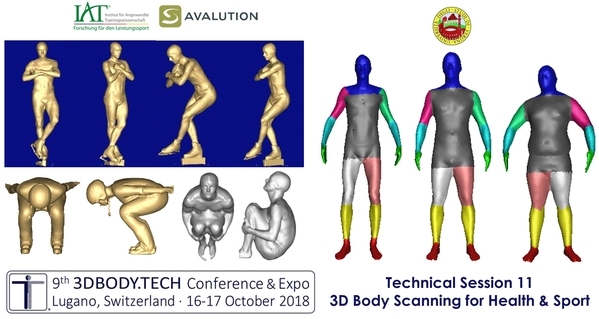 The 9th International Conference and Exhibition on 3D Body Scanning and Processing Technologies will take place on 16-17 October 2018, in Lugano, Switzerland.